Reinforcing bar is used to add tensile strength to concrete. The compressive strength of concrete is ten times the tensile strength. That means it takes ten times the weight, or force, to crush concrete than it does to pull it apart. In reality, concrete is not pulled apart by natural forces. Rather, pressure torques and twists concrete. Torque snaps concrete with weak tensile strength. Cracks in concrete are, more often than not, a symptom of this snapping action, a result of concrete’s weak tensile strength. Compressive versus tensile strength is best illustrated by a spring. A spring can support a tremendous load when weight is applied to one end of the spring’s cylinder or the other. Once compressed to its maximum, a spring becomes extremely resistant to pressure. It is very difficult to crush a spring when force is applied from one end toward the other. However, if one end of the spring’s cylinder is secured in place and pressure is applied laterally to the opposite end of the spring, the coils provide very little resistance. A spring can be bowed into a U shape with very little force. Concrete is weak in the same respect. It is ten times easier to break concrete by bowing it than by crushing it. However, if rods are welded to the spring cylinder lengthwise, bending the spring using lateral force is much more difficult. Rebar provides the same structural integrity for concrete. It is the necessity of tensile structural integrity — or the lack of the need for it — that determines what rebar sizes are required for a concrete job. A fair question to ask is why rebar is given a number in the United States rather than it being referred to by the size of its diameter. It is a legitimate question, particularly considering Canada and Europe reference rebar by dimensional size. The simple answer is, we don’t like to reference a fraction. When we refer to rebar by the size of its diameter it does not provide sufficient information to determine whether rebar is adequate for a job. In the United States, rebar is given a number — #3, #4, #5, etc. — that reflects its solid diameter. The #3 bar is 3/8″ diameter of the solid section, #4 is 4/8″ or 1/2″, #5 is 5/8″ diameter. Yet what does the size change mean in Yield Strength? The minimum yield strength of standard rebar in the US is 60,000 psi. This means that the bar can have a yield strength greater then that but never less. 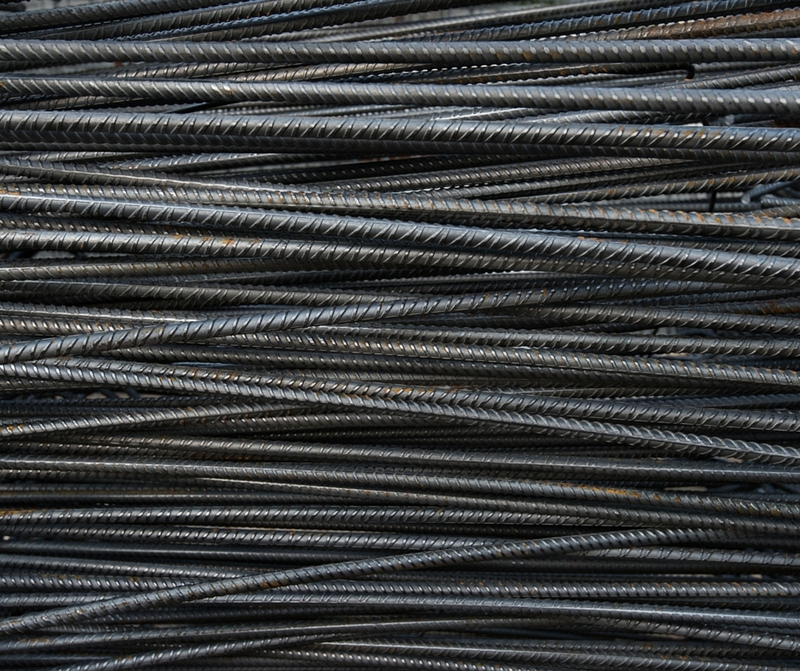 For example, #3 rebar has a minimum yield strength of 6,600 pounds. The minimum yield strength of #4 rebar is (11,780 lbs.) 78% greater. However, the diameter of #3 rebar is only 1/8-of-an-inch less than that of #4 rebar — 3/8-inch versus 1/2-of-an-inch, respectively. In other words, increasing the diameter of rebar (25%) does not make it twice as strong, doing so makes rebar considerably stronger. Yet if we use grade 40 rebar like they do in other parts of the world (where it is 40,000 psi medium yield strength) we come up with quite a different number. A #3 bar would then have a medium yield strength of 4,400 lbs, and a #4 bar would be 7,800 lbs. You are probably asking what is medium yield? Medium yield means that the average yield strength (versus minimum yield strength) is that value. So there are times when less force will cause the bar to yield and there will be times when more force will cause the bar to yield. As such, knowing the dimensions of rebar is helpful, But knowing the minimum yield strength is as well. Which Size for Which Project? For home projects, there are only really three rebar sizes — types — you will need: #3, #4, and #5. The lightest rebar, #3, is sufficient to use for driveways and patios. For projects that, once complete, will bear minimal-weight loads, #3 is usually sufficient. When dealing with walls and columns, #4 or greater should be used. For footers and foundations, it is a good decision to use #5 rebar, though such heavy bar is often considered over kill by many contractors. Using number #5 on footers and foundations does, almost no one will argue otherwise, will minimize settling. Something to be aware of, while rebar has a minimum yield strength, if it is not properly placed, the strength of the concrete will be minimized. Even an inch extra in spacing can reduce the concrete’s tensile strength by 20 percent. Understanding why is a matter of simple math. If the minimum yield strength is constant, that means the tensile strength of the concrete is determined by the amount of rebar in it per foot. For example, if a job calls for rebar every 4 inches per foot, meaning three, placing the rebar every 5 inches means 20% less rebar per foot. It is the tensile strength of concrete that makes rebar a requirement. In determining what rebar sizes are required, minimum yield strength and spacing are the two biggest factors. These two variables determine the tensile strength of concrete. Want to dive deeper? Here are some related articles! What are the Different Types of Rebar? And Does it Matter? What is Rebar and Why Do I Need It In My Next Project?